Exciting news!!! A new Nerissa book has just been released by Amazon as a Kindle Edition, “Red Devils and Heroes”, by author Kevin Paul. “Red Devils and Heroes” is the story of the Nerissa. Kevin is the grandson of Lt. Russell Paul, R.C.A.P.C., a survivor of the Nerissa. As a gift to all interested readers, Kevin is offering a free download of his book on the May 23-25 weekend. The SS Nerissa was torpedoed and sunk on April 30, 1941. Today, April 30, 2011, marks the 70th anniversary of the sinking. Nerissa survivor Walter Herbert Coles passed away on 21 Jan 2011 in Cambridge, Ontario. I attended a memorial service on February 12 in Cambridge to celebrate Herb’s life and couldn’t help notice the respect that everyone had for him. He was loved by family and friends. Herb was a great contributor to the Nerissa website so I will miss his comments and advice. He was a wonderful friend. Please refer to "Remembering Our Loved Ones" for Herb’s obituary. It is with much sadness that I advise the passing of Bernie Atkins on 21 Nov 2009. Bernie was born in Beckenham, Kent and at 11 years old was evacuated in September 1940 from the London bombing blitz, along with his brothers Maurice and Michael. Sailing on the SS Nerissa to Halifax they were then transported by train across Canada to Victoria, British Columbia. Bernie allowed me to post a chapter of his family history book, "Back Then", on the website. The chapter describes the voyage of this group of children on their way to Canada. Please refer to the section "Wartime Evacuation and the Children’s Overseas Reception Board" for Bernie’s obituary. Gnr. Jack Holt, RCA was one of three stowaways who boarded the Nerissa in St. John's Newfoundland on 23 April 1941. Bored with his assignment in St. John's as a coastal artillery gunner, Jack decided he wanted to see action overseas. Little did he know what he was getting into. Jack survived the sinking and served with the RCA throughout the war. Please refer to the section "Remembering Our Loved Ones" for Jack's biography. Nerissa survivor Jack Cockrell passed away on December 21, 2008 in Victoria, BC. Jack was one of the 35 Canadian Army personnel to survive the Nerissa sinking. He served in Europe during the war with the 25th Armoured Regiment and the 28th (B.C.R.) Regiment. In October 1944 he was wounded and returned home to Victoria a few months later. Jack had a tremendous interest in the Nerissa sinking and very kindly gave us the research material he had accumulated over the years. He will be sadly missed. Please refer to "Remembering Our Loved Ones" for Jack's obituary. Paymaster Cmdr. Francis Robert Woodcock Nixon was born in Duncan, BC on February 8, 1904. He joined the Royal Canadian Navy at age 17 as a Paymaster Cadet, serving on HMS Hood from 18 March 1921 to 21 March 1922 on her world tour with the Prince of Wales. Ironically, HMS Hood was sunk by the Bismarck on 24 May 1941, less than a month after the Nerissa. 'Jack' made the navy his career, serving in BC, Ontario, and Nova Scotia in Canada and also in England. Frances Stocks has given us a wonderful biography and photo of her father, which can be seen under the heading "Remembering Our Loved Ones". A couple of months ago we had the amazing good fortune to make contact with Deryck McCusker, a former RAF wireless operator/gunner on coastal command duty the day of the sinking. Deryck's aircraft was a Lockheed Hudson sent from Coastal Command at Limavady, Londonderry on the morning of April 30, 1941. Deryck took two photos of the Nerissa from his aircraft and later wrote on the edge - "S.S. Nerissa, sunk by U552 on 30.4.1941, approx. 80-100 miles to the south of Rockall when I took these pictures." Please refer to the new section RAF Coastal Command to read Deryck's story and to see the Nerissa photos. Nerissa's cargo consisted of aluminium, shells (ammunition), motor trucks, and general cargo for a total of 3,049 tons of cargo. The crew consisted of 104 men, 2 women and 6 DEMS gunners. For the complete breakdown of Nerissa's losses please refer to "Lloyd's War Losses WW2" under "Court of Inquiry & Official Documents". In 2002 Brian Lindner, archivist for the National Life Insurance Company in Vermont, did extensive research on the Nerissa sinking. He was looking for information about a former employee Kenneth Brown Collings who lost his life in the sinking. Brian wrote to Erich Topp, commander of U-552, and Erich's replies give us information that didn't show up in the Court of Inquiry. Namely that he attacked from the surface with 2 torpedoes, not 3. To read Brian's letters please refer to Erich Topp & U-Boat 552. Alfred Baldwin Raper was listed among the missing civilian passengers on the Nerissa. He was in North America on business but also drumming up support for the war. He was a widely travelled businessman. At the request of the authorities he postponed his return to England for a few weeks in order to undertake a number of additional speaking engagements. To read his interesting life story please refer to the new heading "Alfred Baldwin Raper". Before the website went online – November 11, 2004 – I was in touch with Brian Lindner, archivist for the National Life Insurance Company in Vermont. One of the people he was researching was Kenneth Brown COLLINGS, a former employee of National Life and one of the 11 American Ferry Pilots who lost their lives on the Nerissa. Collings was born in Lincoln, Nebraska on September 22, 1897. Upon his death at age 44 he had traveled the world and faced danger countless times in his search for adventure. The National Life Insurance Company have very kindly given their permission to tell "The Kenneth Brown Collings Story" on our website. Even though the Nerissa was a troopship transporting Canadian troops to England she was also carrying a number of civilian passengers. The only family on board was the Lomas family and sadly they were all lost in the sinking. They came so close to surviving as they were all positioned in lifeboat No. 2 when the second torpedo struck. Please refer to "Remembering Our Loved Ones" for the story of the Lomas family. Harold Davies' story is one of the saddest to come out of the Nerissa sinking. 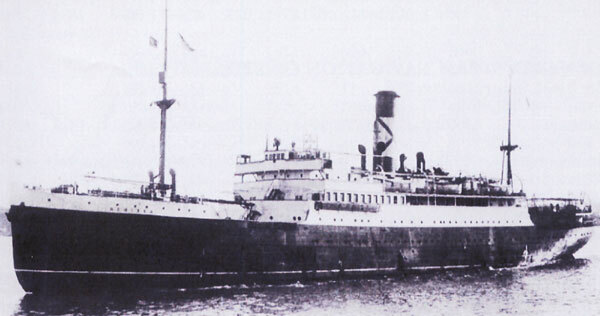 The SS Nerissa was his first ship as a radio officer and the start of his career in the British Merchant Navy. The letter he wrote to his brother Aldridge just days before the sailing shows his excitement about sailing on the SS Nerissa. Please refer to "Remembering Our Loved Ones" for Harold's biography and letter. On November 14, 2006 I gave a talk about the SS Nerissa to the local Sarnia branch of the Ontario Genealogical Society. From this half-hour speech came probably the most detailed survivor account of the sinking we have and also an in-depth study of the radio messages and co-ordinates showing the exact location of the Nerissa sinking. All this thanks to OGS member John Collins who knew one of the survivors, R.G. Paul. Please refer to Lt. Russell G. Paul's account of the sinking under the heading "Newspaper and Survivor Reports" and John Collins' analyses of the radio messages and co-ordinates under a new heading Location of the Nerissa Sinking using Radio Messages and Co-ordinates. It is with much sadness that I advise the passing of John Leonard Saull, retired Captain RCASC, on August 10, 2006. Len was one of the survivors on the SS Nerissa. He provided us with most of the Canadian Army documentation with regards to the Court of Inquiry. I had the privilege of meeting Len and his wife Eileen in Kanata in 2003. Len's personal account of the sinking can be found under Court of Inquiry. Please refer to Remembering Our Loved Ones for Len's obituary. Today is the 65th Anniversary of the sinking of the SS Nerissa. We will never forget the men, women and children lost in that terrible tragedy on April 30, 1941. I recently received copies of the original radio signals from C in C WA to HMS Hurricane and Lincoln concerning the sinking of SS Nerissa. To view these copies please refer to the section "Court of Inquiry & Official Documents". On March 24, 2006 Vicki Brown took possession of her father's ID tags and her baby ring in a special presentation at the North Carolina Museum of History. Her father WO1 William Caldwell of the Royal Canadian Ordnance Corps was lost in the sinking of the Nerissa on April 30, 1941. Please read the news story from Raleigh, North Carolina. Due to a tremendous amount of spam in the last month I have removed the Guest Book from our website. I am grateful to everyone that posted a message on the Guest Book as this has put us in touch with several new Nerissa contacts. Anyone that would still like to contact me can do so through the contact page. Thank you. Ann Hentschel. 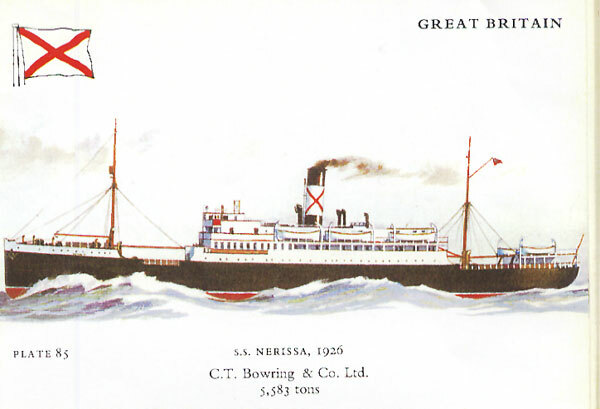 The SS NERISSA played a part in the wartime evacuation of children from Britain. On September 7, 1940 she sailed to Canada with 16 boys and 18 girls bound for Halifax, N.S. Their final destination was British Columbia. Bernard Atkins was a CORB child on this sailing. He very kindly allowed us to tell his story on our website. Please look at our new section, "WARTIME EVACUATION and the CHILDREN'S OVERSEAS RECEPTION BOARD," for Bernard's story and the list of CORB children sailing on the SS NERISSA. History has lost another key figure from World War Two. Admiral Erich Topp passed away in Suessen, Germany on December 26, 2005 at age 91. Please refer to the section "Erich Topp and U-Boat 552" for his obituary. This is the Year of the Veteran and what could be more appropriate on Remembrance Day than to remember and honour our loved ones who served in WW2. This website commemorates those who lost their lives in the sinking of the SS Nerissa on April 30, 1941. Most of the articles on the website to date have been about the events and circumstances surrounding the sinking. This Remembrance Day we are trying to place more emphasis on the individual stories of the men who were associated with the Nerissa. I have received several stories and photos from relatives and friends. These form the basis for a new section on the site entitled Remembering Our Loved Ones. Please contact us if you remember anyone from the Nerissa - passengers or crew. It means so much to their families to know that their loved ones are not forgotten. A children's book has just been published by General Store Publishing House (www.gsph.com) ISBN 1-897113-21-8 entitled "WHAT WE REMEMBER" written by Lesley Anne Airth, illustrated by Mervyn Finch, MBE. This is a collection of non-frightening, true stories written to introduce children to the significance of ‘Remembrance' and to whet their interest in Canada's history and heritage. One of the chapters – "The Telegram" – tells the story of John MacNeil, a civilian casualty on the SS Nerissa. June 7, 2005. Andrew Horrall is the curator of a new exhibit at the Library and Archives in Ottawa called Written By War. He has been on a search to find the daughter of a WWII Canadian soldier, William Caldwell, whose I.D. tags were found along with a baby's ring. That search came to an end yesterday when he found Vicki Brown, Caldwell's daughter. WO1 William Caldwell, Royal Canadian Ordnance Corps was a casualty on the SS Nerissa. Read the newspaper story in our new section "Press Releases"
This website is a collection of pages dedicated to the men and women who lost their lives on the S.S. NERISSA on April 30, 1941. All of us who have contributed to this site hope you will find it interesting and informative. The story is long overdue being told and as readers will see, this is an important part of Canada's WW2 military history. The NERISSA was the only troopship to lose Canadian troops en route to England in WW2. You may be wondering, "Why a website, why not a book about the NERISSA? Why has it taken so long to tell the story?" These are questions that will be answered very shortly on this website. We have a tremendous amount of research material which will be added as we go along. The main thing right now is to tell the story of the sinking and let you read some unbelievable survivor reports. Special thanks has to go to Harry Butler in England for without his help in researching documents at the National Archives, the Maritime Museum, the War Museum and countless other archives, this website wouldn't be possible. The amazing thing is that he isn't personally connected to the NERISSA through a family member. I will let you read his story of how he "connects" to the NERISSA by a number of strange circumstances. Our thanks must also go to Helen Ginn in Sarnia for spending hours and hours typing all the stories and documents. We couldn't have done it without you Helen. Our sincere thanks. We would like to hear from anyone who is willing to share memories, letters, documents, or photos to add to this website. We are launching this website today NOVEMBER 11 - REMEMBRANCE DAY as a special tribute to the S.S. NERISSA and all who sailed on her. With sincere thanks to the COMMONWEALTH WAR GRAVES COMMISSION for their help in supplying all the names and information of the NERISSA casualties and for permission to use their memorial photos on our website.